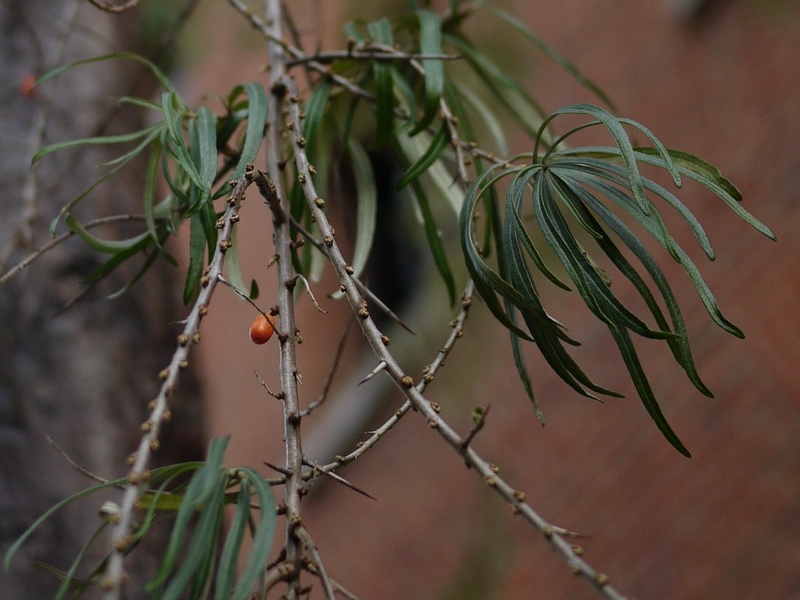 Southwark Leaf and Berry Combo: what is this thorny, evergreen tree with orange berries? On Curlew Street, in that late eighties enclave of converted spice warehouses just east of Tower Bridge on the south bank of the Thames, I have noticed a curious tree. Planted, I imagine, when the area was being cleaned up, they look to me like Giraffe fodder: tall trees with long branches, each bearing a sparse canopy of thin, evergreen leaves and the occasional orange capsule of a berry. It would take a long-necked animal with a dextrous tongue to negotiate these thorny branches – not many of them in these parts. 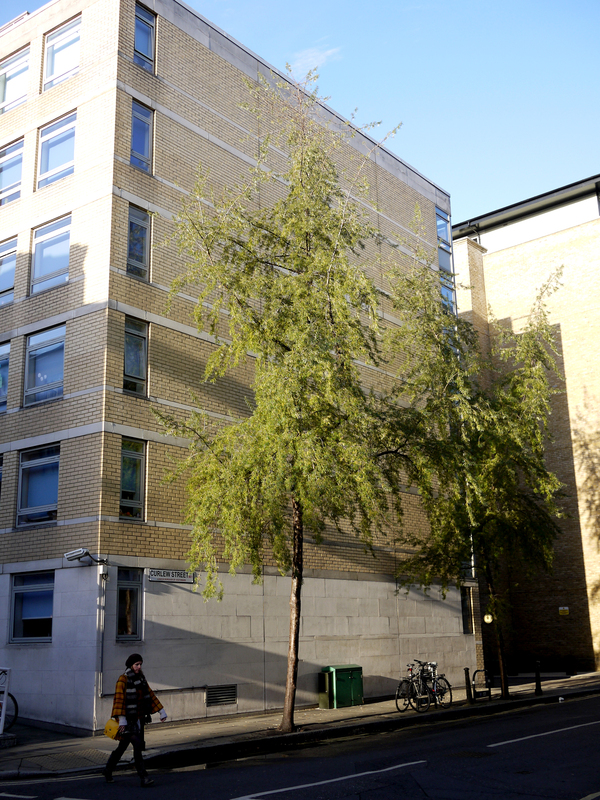 And could a tree from the dry plains of sub Saharan Africa thrive in this urban corner Europe? So what can they be? I have a hunch that the enthusiastic developers of this former dockland took its spicy heritage to heart, and planted rare and exotic street trees to complement the cinnamon, cardamom, ginger and cloves referenced in the new apartment block names. If so it is a reference lost on this flummoxed amateur plant identifier. Or perhaps they are another illustration of Southwark council’s experimental street tree planting programme, as explored in recent posts about Strawberry Trees and the unlikely Persian Silk Tree, to be found in nearby streets. My mystery trees appear to be thriving in this narrow, enclosed street and while I estimate they are up to 30 years old, they look youthful, as if many years growth lie ahead. Given their clear suitability to the urban environment, their elegance and exoticism, they are a species I have not come across before and one whose identity I am, well, stumped by. Yes, related to the common sea buckthorn.